Hello guys , i have this problem for a long time , whenever i join to servers , it shows los santos and says ''Server didnt respond... Retrying'' all the time , i have 0.3.7 version , my firewall is off on gtasa.exe , just dont know why i cant play samp anymore.. Help please! Re: ''Server didnt respond... Retrying'' Help! If none of that works try "tracert [address here]" to test if your signal is actually making it out to the destination. If it isn't, it is a service provider issue, try contacting them. 1,2,3 still cant connect to server and the last one , then i write the same as in yours photo it says ''The system cannot find the path specified. Every time when i join to server. The IP i see in the pics is not of CT server. I was trying join to other servers becouse i was thinking that i only cant join to ct's server. I see what you're typing. Don't type "Windows\system32>"
It said ''trace complete'' but still not working. 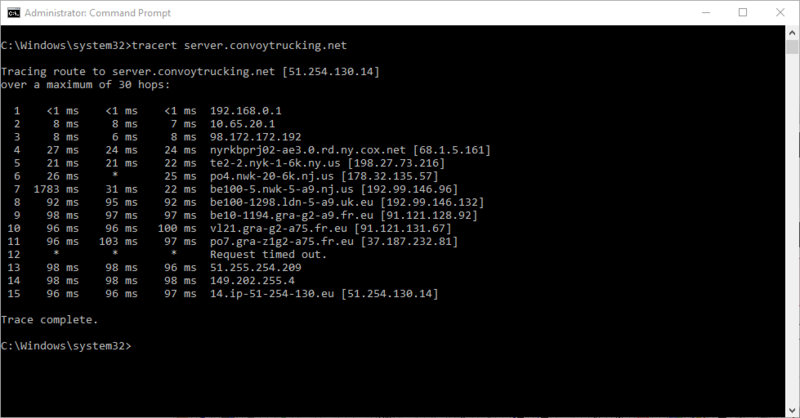 click on the add server button, type server.convoytrucking.net. have you let the access through your firewall, do you use antivirus? 1 nah , 2 cant find ''gta.set'' , 3 i reinstalled them like 3 times from three different sites , 4 renamed , 5 installed but still not working ,6 dont have antivirus becouse i was reinstalled windows week ago. Im so done , am i doing something wrong , or my computer is stupid? Before one year on the same pc i was playing samp and quit the game for one years and now samp do not work anymore. you should have GTA San Andreas user files in your documents folder, if not, you have played it in a while or you have changed settings. reinstalled from 3 different sites?? do you have the original game or steam version because not all downloadable games are complete.. I will try to reinstall one more time , but this time i will find my original gta sa cd.